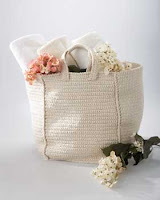 Crochet or knit your own beach and market bags for summer. Washable and ample, this crocheted grocery tote will handle all your summer travel and shopping bag needs and can be crocheted with recycled cotton yarn. This durable tote bag is worked with two strands of yarn throughout on a size G hook or 4 mm and requires 22 balls of handicrafter cotton yarn. The finished size is 12 ins [30.5 cm] wide x 15 ins [38 cm] high x 12 ins [30.5 cm] deep. The free pattern is written in English and French, free from Bernat and available to print out at the link below. What's really cool at Bernat's site is the Color Clicker. Click on the rainbow button and see how the different colorway selections of specific yarn will work with the project you have in mind. 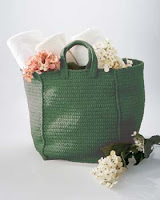 Here's the crocheted market bag in Bernat's forest green handicrafter cotton. If you want to knit a strong market bag for your groceries that easily converts to a beach bag or purse, try this easy knit bag pattern featured as the 'grrlfriend bag'. There are several possible designs for the handles and you can see photos here. This knit tote can be made with recycled worsted cotton yarn. 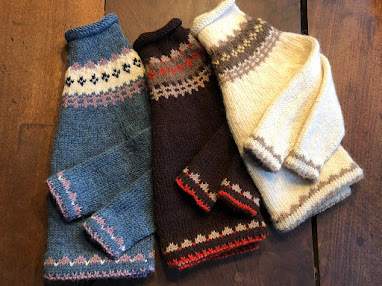 The example at the right was knit with two colors of DK on the bottom and two strands of DK in a single color for the main body of the bag. Find many colors of recycled cotton yarn at sale prices here. If you are not a member of Ravelry, then use this pdf download link for the knitting pattern "grrlfriend market bag." 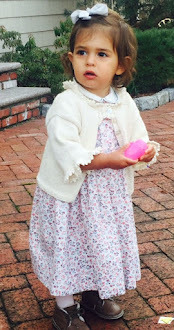 It's an easy lace pattern that lets the sand out and can be knit in any size you wish. It starts with a square bottom knit on size 4 dpns, then graduates to US size 7 (4mm), and eventually worked on a size 10.5 circular needle (6 mm). It's a really fun pattern to knit and use for all your marketing, travel and beach trips throughout the summer. Bernat free crochet market tote bag download.